Named San Francisco's best museum, the Exploratorium is a fun, quirky museum of science, art and human perception that features some 650 'please touch' exhibits. Located inside the Palace of Fine Arts, many of its exhibits are created by visual and performing artists as well as scientists and educators. Exhibits such as the off-site Wave Organ, a unique sonic exhibit that is located on a nearby piece of land jutting out in the San Francisco Bay, can be found nowhere else in the world. It is one of San Francisco's most popular museums, drawing over 500,000 people each year, with attractions such as its three-dimensional pitch-black Tactile Dome inspiring many visitors to approach challenges in a very different way. 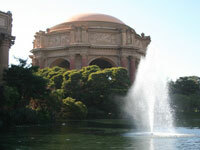 The Exploratorium frequently has fun, interactive Thursday night events for adults. Transport: The Exploratorium has convenient access to public transportation, accessible by Muni’s F Market streetcar stop and Muni bus lines 2, 6, 14, 21, 31, and metro rail lines J, K, L, M, T, N stop within walking distance, amongst other options. Opening times: Open Tuesday to Sunday 10am-5pm. Closed Mondays, except Martin Luther King Day, President's Day, Memorial Day and Labor Day. Closed Thanksgiving, Christmas Eve and Christmas Day. Admission: $30 adult, $20 children, other concessions available.